Many parents wonder if their tall toddler is ready for a booster seat, or if there's an age requirement. It's easy enough to check the weight and height limits of various boosters to see if your little one will fit according to manufacturer instructions. Does that mean it's time to switch your toddler to a booster seat? If you can safely keep your child in a harnessed car seat for a while longer, do it. Most 3-year-olds are not ready to ride in a booster seat in the car, even if they fit within the manufacturer's height and weight guidelines. The best practice is to keep your child in a harnessed car seat to at least 40 pounds and 4 years, but preferably longer. Many convertible car seats have harnesses rated to 65 or even 90 pounds. Most children can fit into the harness of one of these car seats well past age 4. In fact, children in the U.S. today can often stay in a harnessed car seat until age 6 or beyond. 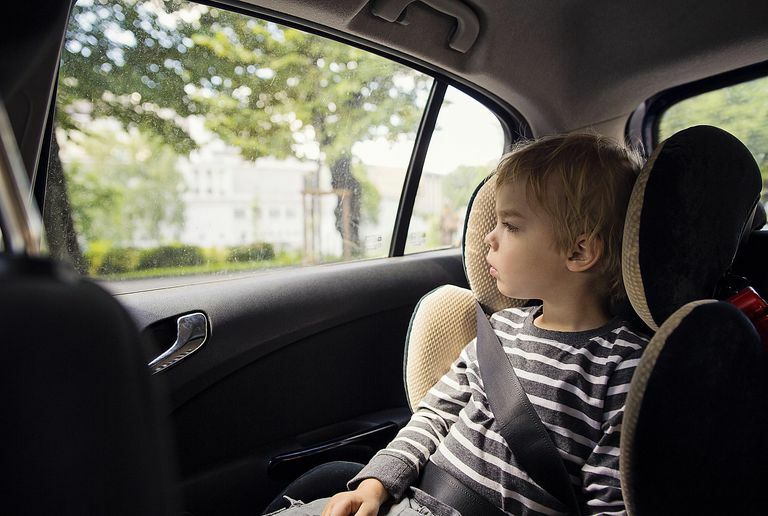 Thanks to advances in car seat safety technologies and developing crash testing methods, 4-year-olds that might have been moved into a booster 10 years ago can still safely ride in a rear-facing car seat! Even fairly tall children can remain rear-facing through toddler years and then switch to a forward-facing harness until kindergarten age. For most toddlers, there shouldn't be a reason to move to a booster at age 3. Should You Wait to Switch? Many booster seats wouldn't be appropriate for a smaller toddler because of the minimum height and weight. While some high-back booster seats have a minimum weight of 30 pounds, there are lots of other booster seats that require a child to weigh at least 40 pounds before use. From a practical standpoint, parents tend to have an easier time keeping their child in the harnessed car seat altogether. The vehicle lap/shoulder belt is much easier to unbuckle than a harness buckle, so if your child is an escape artist, moving into a booster won't help. More importantly, the child must be able to sit in the proper position and be able to stay there in order to be safe in a booster seat. This means no leaning forward, sideways, slouching, or wiggling out of the shoulder portion of the seatbelt. The seatbelt cannot protect a child who is not in the proper position. Most children cannot be trusted to sit properly until at least 4 years old. Many parents find that their child is actually much older than 4 before they can be expected to sit still in a booster. If you think your toddler is outgrowing his or her harnessed car seat, first be sure that you're checking the right signs to judge the fit. Pay close attention to the weight limits of the car seat and be sure you're looking at the forward-facing harness weight limit, not the booster weight limit (if it is a combination car seat). Also, check the manufacturer's instructions for other ways to determine that the seat is outgrown. When your child is forward-facing, the harness slots should be at or above the child's shoulders. When the shoulders are above the top slots, it's time to change seats. A forward-facing car seat is also outgrown by height when the tops of the child's ears reach the top of the car seat shell unless the manufacturer states otherwise in the instructions. Most children outgrow harnessed car seats by height long before they outgrow by weight, particularly with the 65-pound seats. If your child truly has outgrown a 40-pound limit harnessed car seat and is still under age 4, it's best to look for a car seat with a higher harnessed weight limit first. There are many combination car seats available today with a higher harness limit that later become booster seats if you're concerned about buying another car seat and then a booster. As long as it is used properly, any car seat with a higher harnessed weight limit would be a good choice. The range of car seats available today means no family should struggle to find even a budget model that allows their child to remain safely harnessed to a minimum of age 4, and most likely far beyond that. Still not sure if your toddler is riding safely in the car? Visit a check lane or inspection station and have your car seat inspected for safety.